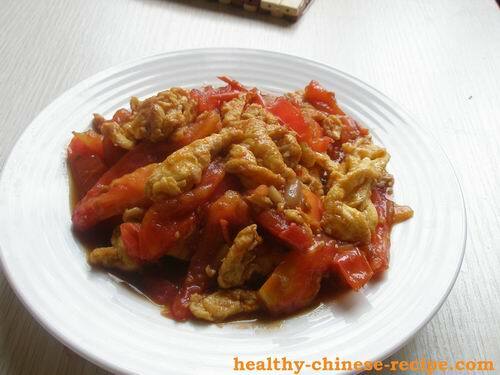 Tomato Fried Egg is heart healthy Chinese food in summer.Fresh tomato can clear away the heat in the heart. The hot weather is easy to cause thirst and heat inside our body. Tomato cools our body and quenches the thirst. Egg soothes the nerve and supplements much nutrients. This dish's key cooking skill is to stir fry egg. It is a little different from that of scrambled egg. You don't need add anything in the egg mixture, or just add pinch salt, pepper, or five-spices. Fully beat the eggs; spread the egg liquid evenly on the bottom of a wok. If the fried eggs are delicious and tasty, the whole dish will not too bad. Each person's taste is different. If you like more tomatoes, then put more tomatoes. I found that friends who live in America tend to add more eggs. I prefer a little bit more tomatoes. Tomato and Fried Egg tastes perfect when served with Chinese pancake. So I like a little more juice in this dish. Some people like dry without any extra juice. Pick soft and juicy tomatoes and cook longer time can produce more juice. To make this dish dry, just pick hard and less juice tomatoes, cut into thin strips, and cook shorter time. Some friends don't like tomato's acid flavor. They would add some sugars when cooking. Tomato Fried Egg can be served with Chinese pancake, bread, steamed rice, tortilla, almost every main food. I prepared two methods for you: a simple way and a little complicated way. I don't see big difference. How about you? 1. Crack eggs, beat evenly. 2. Heat oil in a wok, slip in egg mixture. Sway the wok to make sure the egg spread on the bottom of the wok evenly. When egg liquid becomes solid stir into small pieces. (strips or blocks). 3. Add Seasoning A, stir fry 2 or 3 times. 4. Add tomato, soy sauce, and salt. Stir fry 2 minutes. Serve. 1. Crack eggs in a bowl. Add pinch salt and five spices. Beat well. 2. Heat oil in a wok. Slip in egg mixture. Stir fry into small pieces when becomes solid. 3. Take fried egg to a plate. 4. Add 1 teaspoon additional olive oil in a wok. 5. Add tomato, soy sauce. Stir fry several times. Put back egg. 6. Stir fry well, add salt. Stir fry 1 minutes. Tip: Taking fried egg out and then put back can keep the egg tender and soft, not over cooked.